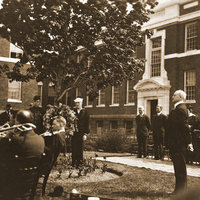 President Deborah F. Stanley invites the campus and community to the unveiling of the World War I commemorative plaque on the 100th anniversary of the Armistice. The unveiling will be held near Washington Boulevard between the Park Hall parking lot and Sheldon Hall. Nice way to acknowledge a bit of history from WWI and on Veteran's Day as well.